Edward Gregson‘s Saxophone Concerto is to be given its Swiss premiere by the young and highly-acclaimed British saxophonist Jess Gillam. She joins the Argovia Philharmonic and their chief conductor Douglas Bostock in three concerts beginning on 23 September at the Kultur & Kongresshaus, Aarau and the Trafo-Halle, Baden. The concerto will form part of an all-English program entitled ‘England A-hoy!’ to honour the eighteen-year career of the British-born Bostock with the symphony orchestra. Jess Gillam is fast becoming one of the most in-demand and recognisable names in contemporary classical music. She became the first saxophonist to reach the final of BBC Young Musician in 2016, and performed at this year’s Last Night of the Proms, won the Sound of Classical 2018 at the Classical Brits and recently became the first saxophonist to sign an exclusive contract with Decca Classics in the label’s history. She will soon release her debut album containing, amongst others, works of Michael Nyman, whose concerto Where the Bee Dances she performed at the Young Musician final. Gillam is the second artist to perform Gregson’s concerto in a major concert setting. The Saxophone Concerto was commissioned by the Japanese saxophonist and Yamaha artist Nobuya Sugawa, a champion of modern saxophone repertoire, and was premiered by him with the BBC Philharmonic in 2006. Its three movements, played without pause, are at times emotive, jazzy, violent, and bustling, and has the soloist switching between alto and soprano saxophones, alongside prominent parts for piano and kit percussion. 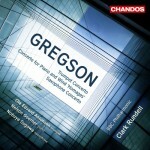 Gregson’s many brass concertos have become standards in the repertoire, and this energetic and characterful concerto is certain to join them. Gregson will also conduct a concert of his music on 22 September with Brass Band Imperial Lenzburg.